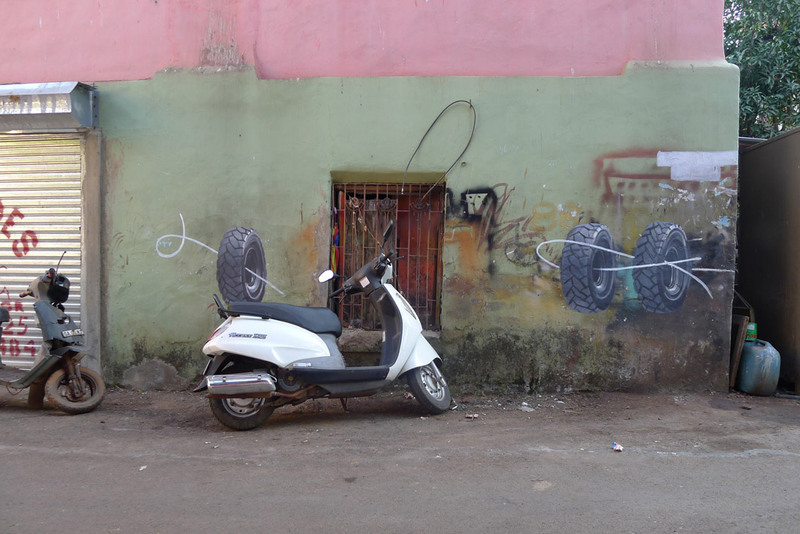 In an effort to connect with the Panjim community in Goa and help combat the negative stigma of street art, Spanish muralist Escif decided to get a job there, offering to work for free and paint “whatever you want.” Check out more images below, along with Escif’s descriptions of each piece! First time I’d visit Ms. Shiwadatta, I was impressed that her shop was almost empty. She had just some sweets on pots and few old notebooks to sell. Ms. Shiwadatta lost her husband around 10 years before. 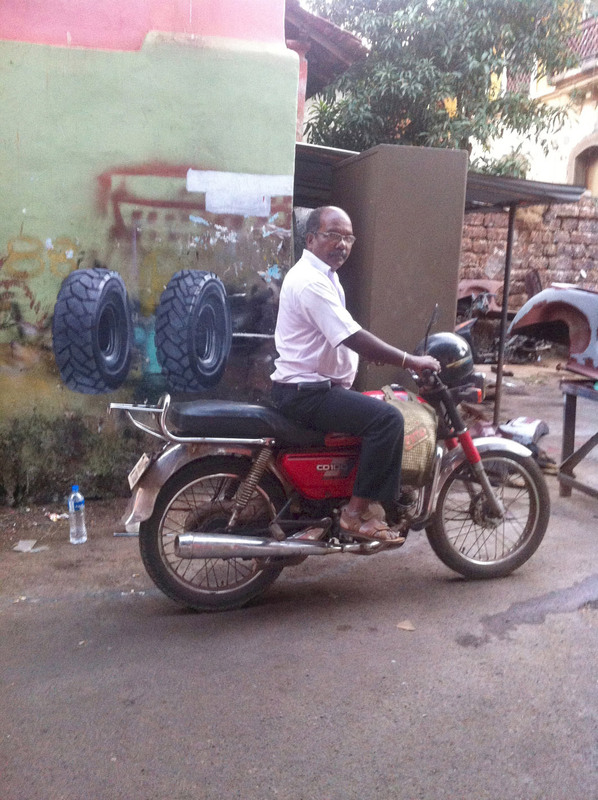 He was the owner of this shop where he used to repair old damaged furniture. When Mr. Siwadatta died, Ms. Shivadatta get alone and very sad. 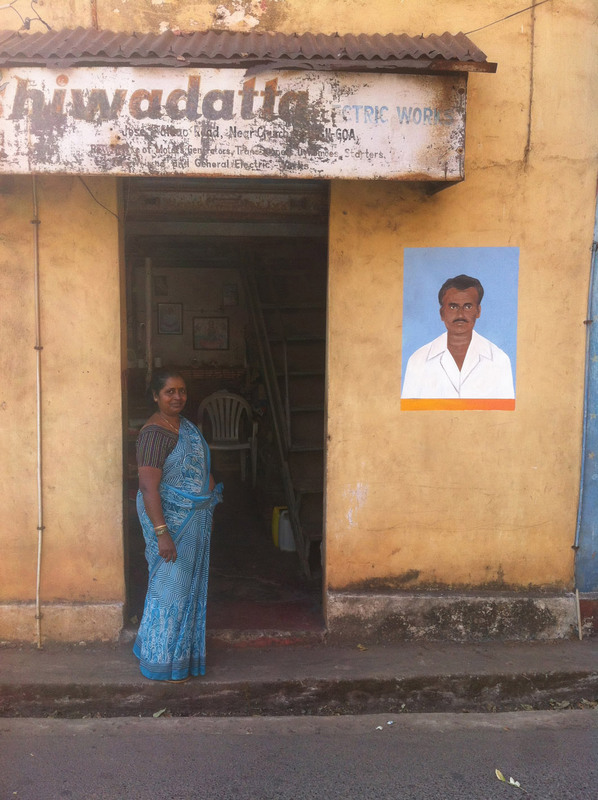 She decided to keep her husband’s shop and wait for him till the death. Ms. Shiwadatta ask me to paint the image of Mr. Shiwadatta, so she will feel that he still there to accompany her loneliness. 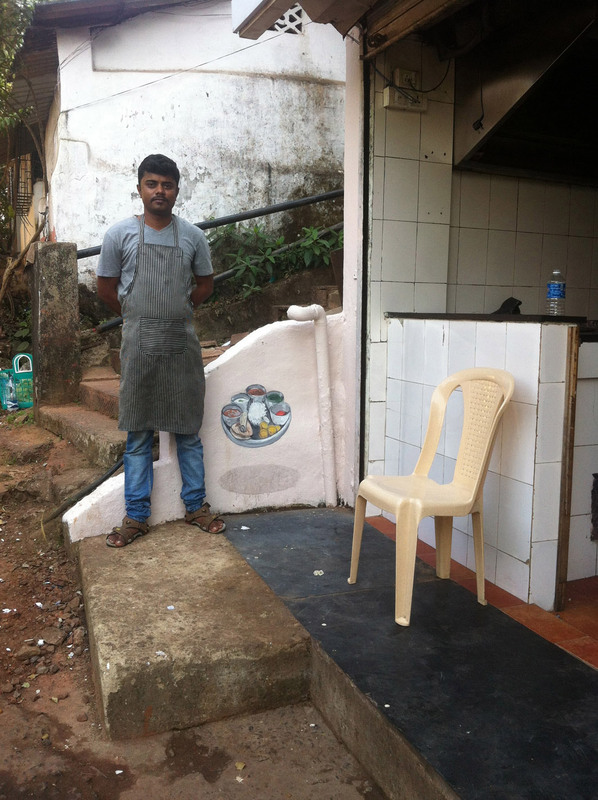 Kiran works in a family business with his father, making keys. His grandfather worked on it and the father of his grandfather too. 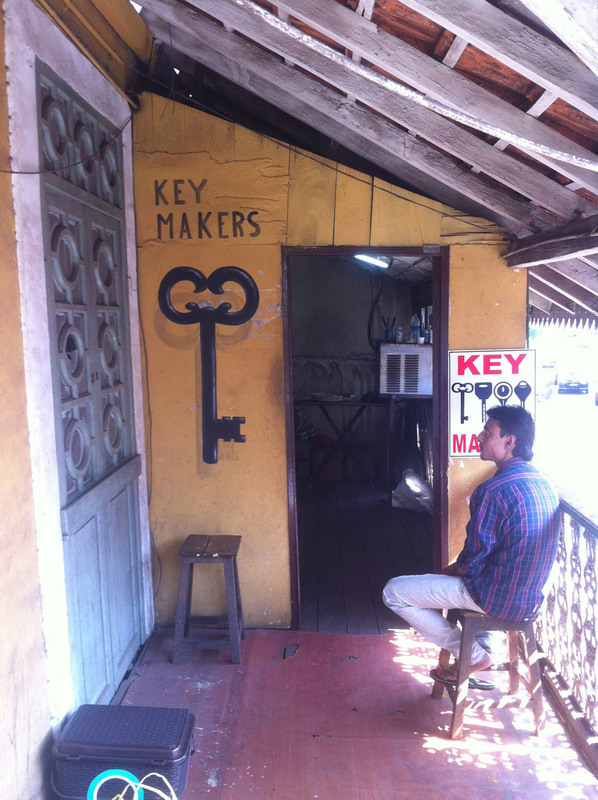 They own the biggest keys makers studio in all Panjim, although if they are in a small place. Kiran told me that they don’t need a bigger place to do their jobs. 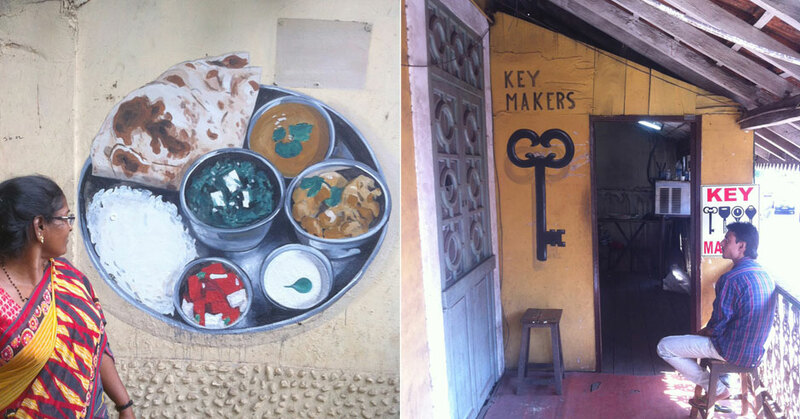 Kiran asks me to paint a big old key on their facade. Not because they build big keys, but just because they are a big business although if their local is a small one. Veghi-Talhi is a typical vegetarian dish from south India. 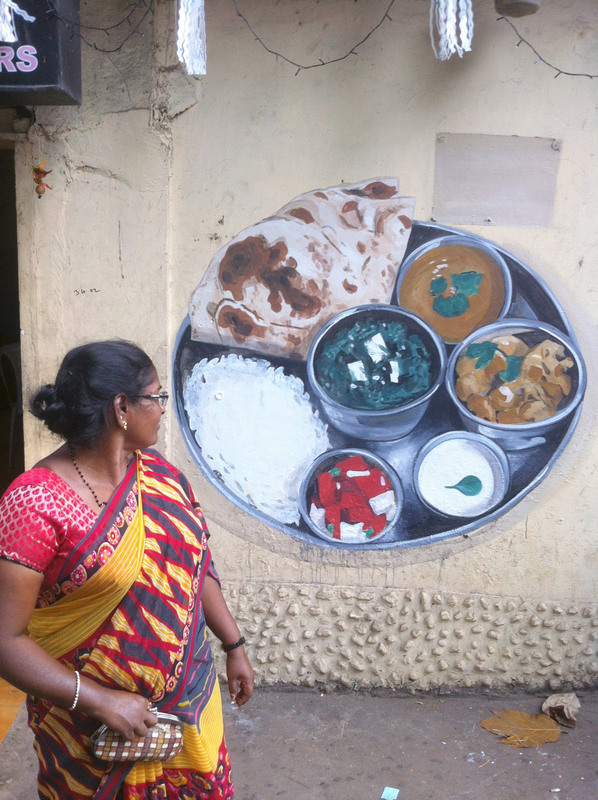 The owner of “Hotel Cafe Prasao” restaurant ask me to paint a big “Veghi Talhi” on their facade. He was proud of it. 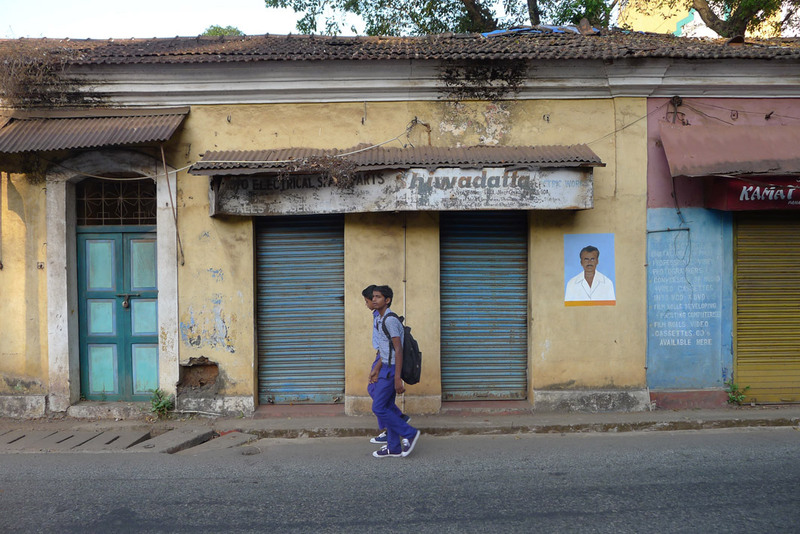 Two women share space on a small local on the main road in Panjim. Naila sells stamps. Shaili is a Dental Doctor. 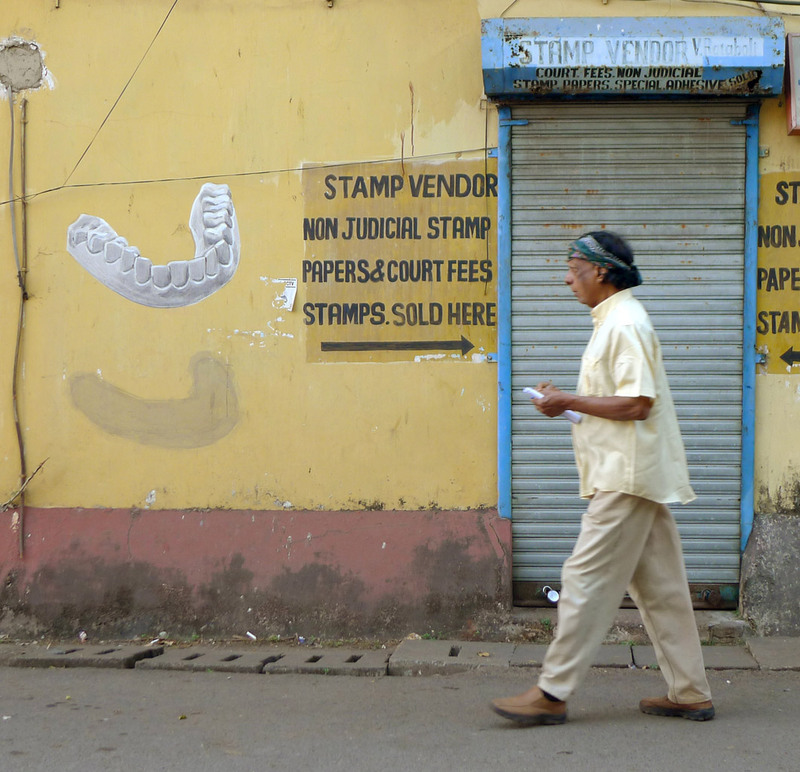 Stamps sell is announced in a beautiful advertisement on the facade, but Dental Clinic indication is not so visible. 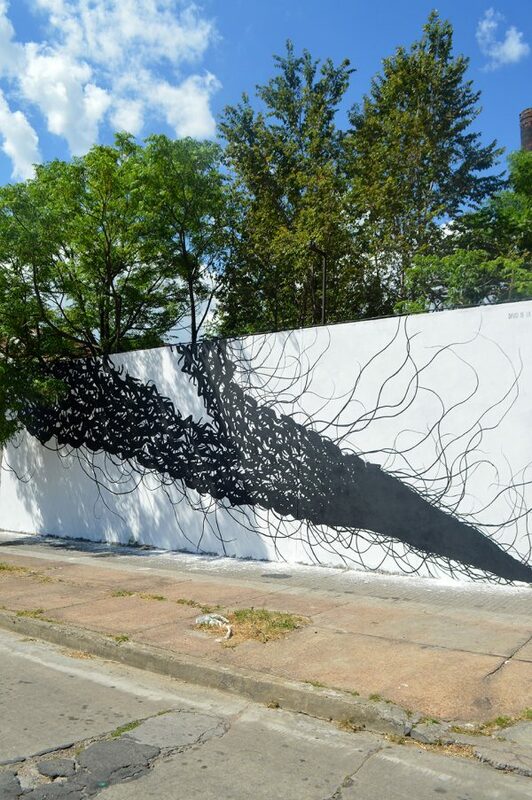 They ask me to paint some teeth on the side of the wall to reach a bigger audience. I think that’s a good idea. 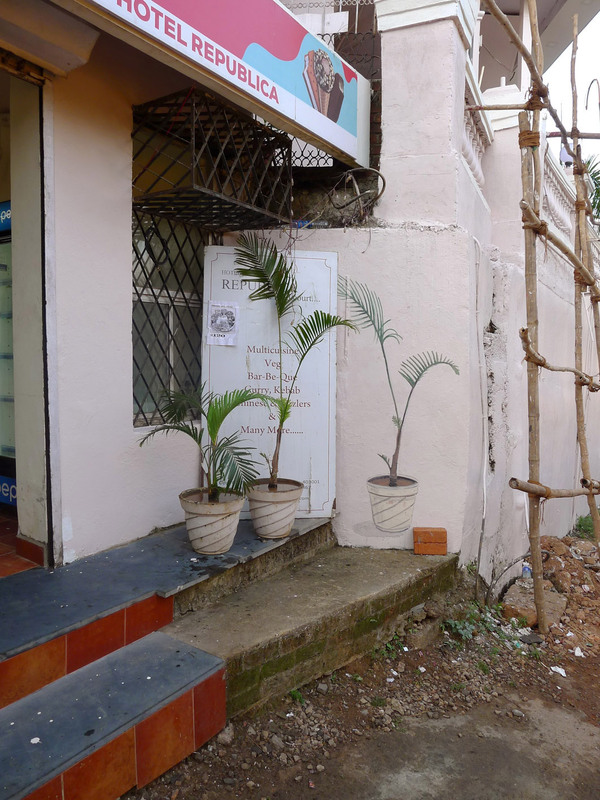 The wall of this Panjim Garage was really damaged. 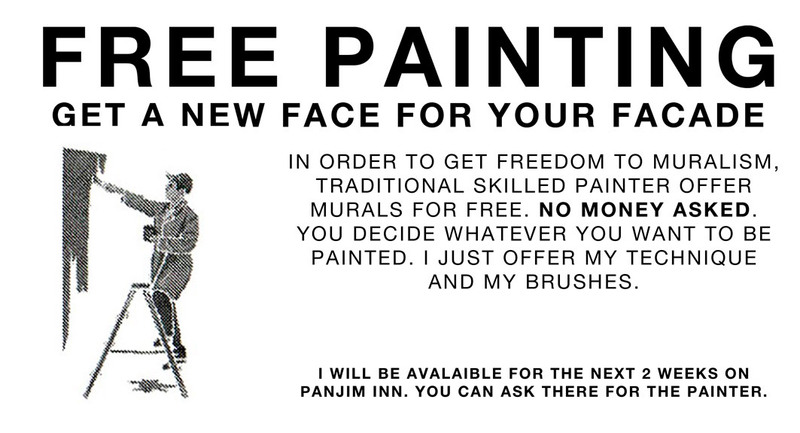 The owner asks me to paint something. When I ask him about what to paint he told me to paint just wheel. Sounds a good idea for a garage. After finishing, he was surprised about my painting and I realise that my English was not so good, that I misunderstood him. What he asked me was to paint well. Anyway, he was happy that the wheel was well painted. Always confused with English language. 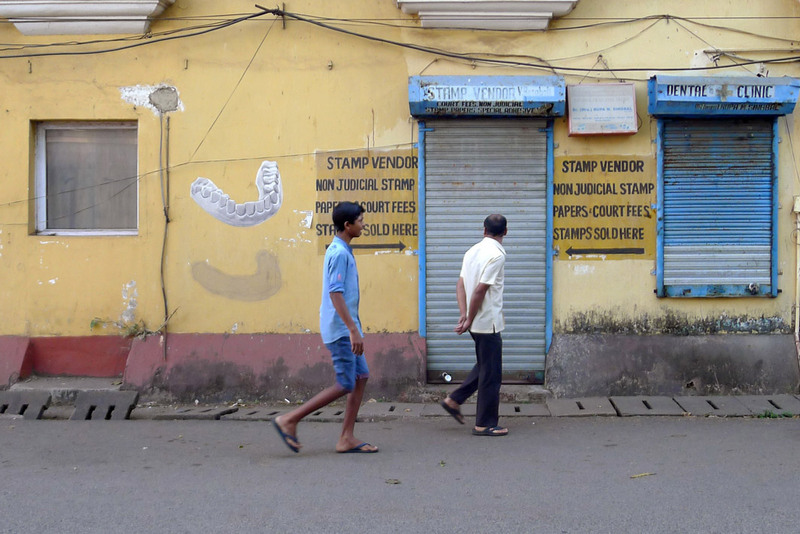 Panjim is a small town. After a few days, a lot of people knew my new job and I’ve received a lot of non paid commissions. Close to the first restaurant, there is another restaurant that also sells Veghi-Talhi. They were jealous of its neighbors. They ask me to paint same painting. They just don’t have a big facade to do it, so I tried to do my best. The owner was happy to say that maybe they don’t offer bigger Veghi-Talhi in town, but they are proud to be honest with what they announce. The dish you can see on our facade is the same size as the one you can buy in. 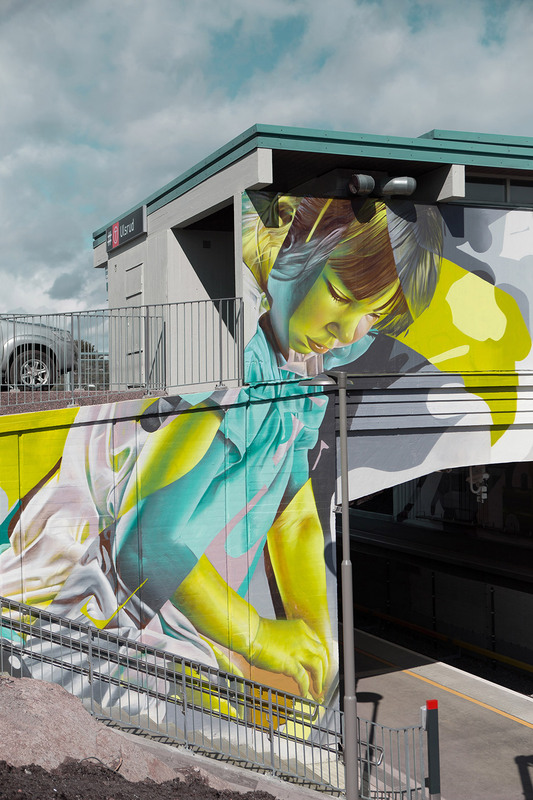 … by the way, he asks me to paint some more plants to the side. Looks more tropical now! 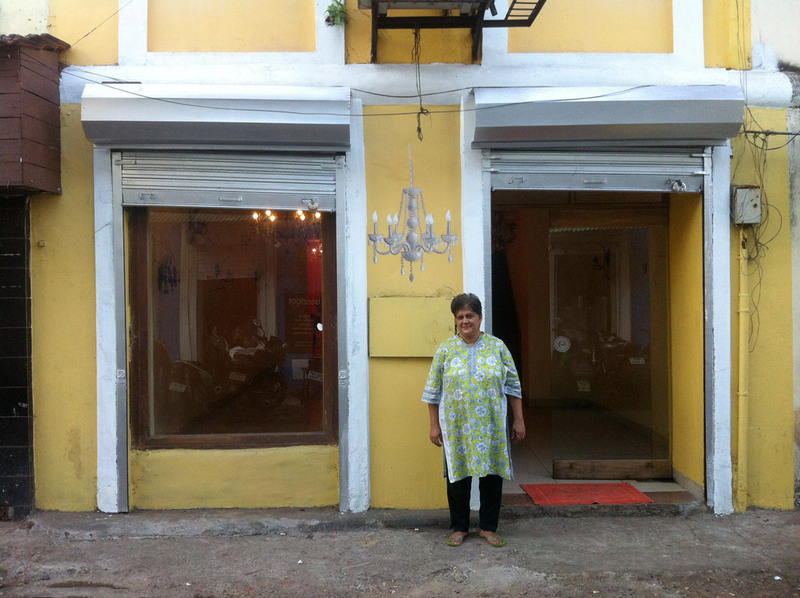 Fatima recently opened a candelabrum shop with her husband. They import beautiful candelabrums from Turkey and sell them on good prices to local people. 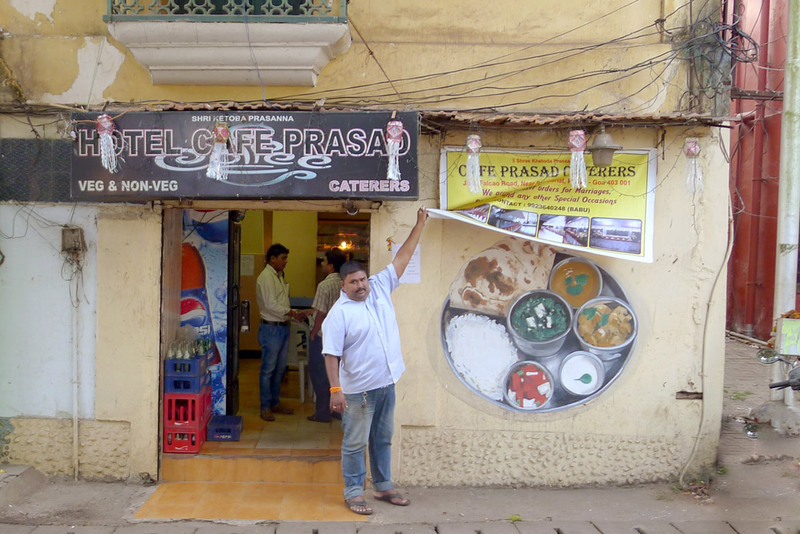 There is not a similar shop in Panjim. Fatima was convinced that this will be a successful business. Indian people love shiny things.